Fit Foodie Megha: COCO Sushi and Bar : Members only club – Class apart! — Reviewed! COCO Sushi and Bar : Members only club – Class apart! — Reviewed! Nightlife in Pune has gone to another level with the Pune's first ever Members only lounge - COCO Sushi and Bar. Embrace the opulence in Pune on the 12th Floor, Onyx Towers. The concept of COCO is laid by the owner Kunal Mhaske, a well-known restaurateur in Pune, who already has successfully established brands like Raasta Café & Penthouze in the city. His inclination towards black is evident in the decor of the place. The entrance is quite dramatic, looks like perforating a different world. Lavish decor, dark ambiance, starry blinking lights along the side walls and the stylish chandeliers on the ceiling enhances the exclusivity and luxury of the space. Stunning interiors and panoramic view of the city is worth watching. Sophisticated members can gather to wine and dine with the similar faces around and can party in a close knit social circle, which maintains the privacy and safety. Comfortable couches, private dining space, outdoor spaces, black and golden tone add to the sleek aesthetic. 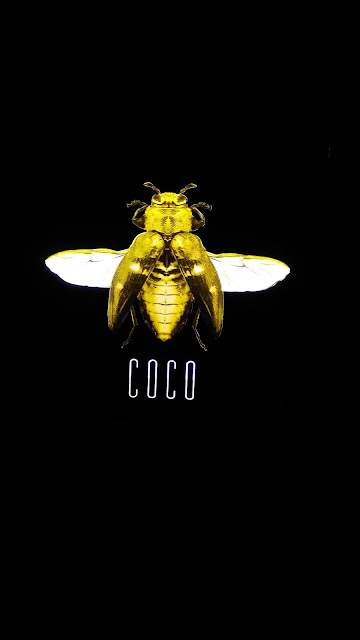 'Golden Bee', the logo of COCO Sushi Bar, mounted on the central pillar, is the highlight of the restaurant. Right now, the membership is by recommendations or by calling the club directly. COCO has an extensive range of Asian appetizers. Chef Jugal Pradhan is the man behind the menu. Right from the soups, salads, dimsums, dumplings, nigiris, sashimis, the portions are customized to individual servings and to offer a variety. The flavours are quite balanced and suitable for Indian palate. Miso Siro Soup (Rs.120), a typical Japanese nourishing breakfast. Strong flavour of miso, though warm and comforting. A perfect way to start the meal. California Sushi Roll (Rs.300) is usually a meaty roll, but made in vegetarian with seaweed sheets, sushi rice, cucumber and cream. Presently beautifully with the pickled ginger and wasabi. The roll was fresh with perfect texture. But I like crunch, so asked for the Crackling Spinach Sushi Rolls (Rs.300). And then came the eye-catching dish. The rolls of sushi rice filled with cucumber, topped with chilli mayo and rolled in crispy fried spinach crumbs. The crunch and taste was definitely there. Loved it! Som Tam Salad (Rs.190) was up next. Made with Raw papaya, the salad is tangy, spicy and full of crunch prominent by peanuts and thai chillies. It was served in the Iceburg Lettuce bowl and loved the fact how with the first bite, all the flavours just burst in your mouth. I was almost stuffed with the soups, rolls and salad but the love of tofu made me order the Lemongrass Tofu Saute (Rs.240). Crispy fried melt in mouth tofu sauteed in tangy, spicy sauces with hint of lemongrass, chilli and garlic. Who would say no to Tempura Vegetables? Bell peppers, carrots, broccoli were deep fried and served with mayo. They were crisp and tasted lip-smacking. Recommended! Done with the main course, I was eager to try the asian inspired desserts. They have selective choice – Sorbet, Mousse, Panacotta, Ice-creams to name a few. I tried Lemongrass Pineapple Sorbet. This was a treat in summer time. Citrusy pineapple and strong tint of lemongrass makes it a worth trying. Wildflower Honey Panacotta was a perfect dessert for the evening. A must have. I liked the presentation and the taste. And how can I forget the sinful Smoked Chocolate Moussecake. It was heavenly. A must try! Bar will be open for dining on all evenings of the week except Mondays while the club nights will be on Wednesdays, Fridays and Saturdays, 1130 pm onward. Members can make reservations for their guests for dining from their registered mobile number, but will need to accompany the guests for club nights.